On November 21st, 2015 at approximately 1:50 A.M a deputy from the Richland County Sheriff’s Department stopped to investigate a suspicious vehicle with two occupants inside, behind the Village of Viola Post Office. The two occupants inside vehicle were identified as Kevin Anderson, and Christina Stone. When contact was made with Anderson and Stone, an odor of marijuana was present coming from the vehicle. A search of the vehicle and persons inside was conducted. During the search 129.8 grams of marijuana was recovered from inside the vehicle as well as 2.1 grams of cocaine and other drug paraphernalia. Four grams of cocaine was also found on Anderson during a search of his person. 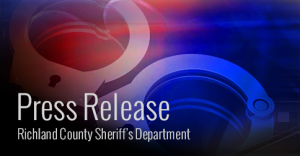 Anderson was arrested and transported to the Richland County jail and is facing charges of possession of cocaine, possession of marijuana with intent to deliver, possession of drug paraphernalia, and obstructing an officer. Stone was also arrested and transported to the Richland County jail. Stone is facing charges of possession of marijuana and possession of drug paraphernalia. Anderson is currently being held in the Richland County jail on felony drug charges. WHERE Incident Happened: Viola, WI Post Office parking lot. ARREST or CHARGES: Possession of Cocaine, Possession of Marijuana with Intent to Deliver, Possession of Drug Paraphernalia, Obstructing an Officer.